Alfama, Lisbon’s oldest neighborhood, is a vibrant neighborhood known for its sophisticated restaurants and authentic bars tucked down narrow side-streets. Here you’ll find all sorts of delicacies; work through our list of Alfama’s best restaurants to get a taste of what it has to offer. A few minutes walk from Rossio Square, Casa do Alentejo is housed in a Moorish-style palace, which was built almost a century ago. Casa do Alentejo also has a library and a shop selling handicrafts, so be prepared to spend a few hours here. The restaurant itself is on the second floor, and perfect for fine dining with its grand wood panelling; try the succulent tuna steak. There is also a cafeteria on the first floor, which is popular with locals for its fish tapas and beautiful traditional Portuguese tiles. Adega Victor Horta is a traditional wine cellar with wines actually produced in the basement. Customers can sample a few varieties of wine before making a decision on which one to order. 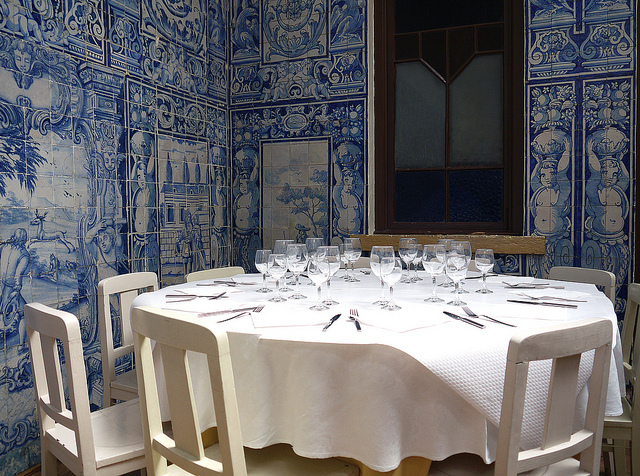 Adega Victor Horta offers classic Portuguese dishes of excellent quality in a cozy, romantic atmosphere of brick walls, countless wine barrels and dimmed lights. Or just come and enjoy the fine wine with a selection of petiscos, small plates of nibbles that are Portugal’s answer to tapas. Located in the historic center of Alfama, ZamBeZe offers great views of both the river Tagus and Baixa district. The restaurant itself is based in the former Loureiro Market and offers a fusion of Portuguese food with fresh African flavors. Sit out on the huge open terrace in summer; in winter return to the interior, minimalist, with its cream furniture and tableware provided by Vista Alegre. Le Petit Café is well positioned between the Sé Cathedral and the Castle of Sao Jorge, and has both a wine bar and a restaurant on site. Drinks and meals have reasonable price tags, which makes this tiny place especially attractive. The menu itself offers a great selection of fish, especially the octopus, which is well-presented and beautifully plated. Chapitô is a circus school project that has become more widely associated with their restaurant side-project. The variety of dishes on offer are rooted in traditional Portuguese cuisine, but executed with modern creativity. The octopus with sweet potatoes and passion fruit dessert are recommended. Try and get a seat on the terrace, which offers fantastic views of Lisbon’s skyline, especially at night. The downstairs bar has alternative theater and live music concerts for post-meal entertainment. This gourmet restaurant is located in a former port building near Santa Apolonia station. It’s a spacious venue with fantastic views of Lisbon’s Port of Cais da Pedra. Enjoy them from Bica do Sapato‘s open terrace, protected from the wind by glass walls. The ambiance is chilled here and the menu unconventional, including a sashimi and sushi bar. These tea rooms are located in a former 19th century Brazilian art nouveau residence that has been transformed into the luxurious mini-hotel of the same name. This place offers great breakfasts and brunches, with a choice of pancakes and club sandwiches, as well as a selection of award-winning teas. The public rooms and library are decorated with embellished carvings and art and the terrace is a beautiful place to sit out in warm weather with one of the delicious croissants or homemade cakes. It might be a beer house, but Ramiro’s house deserves inclusion in Lisbon’s top tier fish restaurants. Founded in 1956, it’s famous for its seafood, a fame that has spread far beyond the Portuguese borders. The venue occupies three floors, each of which differs in the amount of noise and atmosphere. For a light bite, the prices are reasonable for great tapas, and the service is fast. Customers are strongly advised to book in advance, because you won’t get a table without reservation. Trigo Latino speciality is a mixture of contemporary Portuguese cuisine with Latin-American flavors that are rich in spices. The creative menu features delicious dishes with unusual names ; ‘pillow salmon’ or ‘woodpecker tuna.’ Try the bass on bread and their speciality citric sauce with vermouth and fresh herbs. There’s a varied list of quality wines from around the world too. Bela Vinhos e Petiscos specializes in petiscos, or traditional Portuguese snacks, and mixes them with the flavors of some of Portugal’s former colonies in Africa and Asia. Try the baked cod, sardines and eels, washed down with great and inexpensive sangria. The interior features an eclectic setting, with colorful cutlery glued to the walls and hung on the ceiling. Artists perform Brazilian and African music, and the restaurant frequently holds poetry nights and private fado performances.